The Believer’s longtime interviews editor spoke to us about how oral literature and cultish motivational speakers informed his debut novel The Book of Formation. Because we live within a culture of celebrity, many humans, at least American humans, are wired to seek out self-improvement. But learning how to achieve one’s full potential can be difficult, which is why the self-help industry, which pulls in some 11 billion dollars a year, has become the botox of American society. Its more charismatic gurus command high speaking prices, and at any given time at least one of self-help book can be found on the New York Times Bestseller List. Whether you think these gurus are full of guidance or full of crap, when you consider that they have shown power to convince people to pay thousands to practice atypical behavior—such as walking across hot coals or giving up nearly all possessions— they can also be undeniably full of intrigue. Motivational preaching is at the heart of writer Ross Simonini‘s fiction-transforming debut novel The Book of Formation, now out with Melville House. The narrator, an unnamed freelance journalist, is given the opportunity to interview Mayah Isle, a Malibu-based transformation guru and talk show host who, through her “personality movement” (or PM), has climbed to Oprah levels of fame. Isle’s philosophic teachings promise to optimize people’s character via a calibrated force called “p” (a sort of “qi“) that can raise one’s self-awareness to Jedi-like levels. But when Isle instead suggests that he speak to her adopted son Masha, the journalist undergoes a long-term series of interviews with a child who has been born and raised into a peculiar belief system, a project that will beget the journalist’s own personal metamorphosis. No contemporary novel I’ve read resembles anything near The Book of Formation, which is ingeniously written as a series of interviews and prolix introductions, an evolution of the format Simonini has honed in his many years as interviews editor of the Believer. Simonini also co-hosted the magazine’s radio show, the Organist, and has taught a class on oral literature at Columbia University. In addition to his writing, Simonini is something of a modern polymath—musician, visual artist, filmmaker, actor, radio host, editor, critic,—or what self-help guru Barbara Sher calls a “scanner” personality, someone who masters one pursuit before moving on to master another. One wonders if, with enough motivation, Simonini could write his own “you can do it too” manual. Because much of the Book of Formation is written as a series of interviews, there is an expediency to being introduced to the strange, cult-like world and pseudo-philosophies of the interviewer’s subject, Masha. We come to understand things as the interviewer does, and without his ability to interrogate the protagonist, I’m not sure how else this novel could’ve been written. Do you feel that the form of an interview allows for a sort of storytelling freedom that more traditional narrative points of view don’t allow? I’m pretty suspicious of time, which is the basis for a lot of storytelling. My mind doesn’t work in a regularly forward-moving narrative. I can remember places and spaces far better than the order in which events happened. I’m sure other people feel the same way, which must be why memory palaces are so ancient and successful. For me, time just isn’t how people describe it, so I can have trouble with the way writer’s create time in fiction. I often prefer how non-fiction doesn’t ask the reader to keep pace with the writer’s sense of fictional time. I’ve always admired works of fiction that can exist in a timeless nonfictional space. Pale Fire, with its analogous dialogue style, might be the best example of this. In conversation, we don’t limit ourselves to the relentless treadmill of temporal causality. And then what. And then what. You can move through subjects in tangential ways, connecting subjects through associations that more closely mirror human thought: that reminds me of something… When you’re in conversation, these kinds of temporal jumps and digressions and non sequiturs happen naturally. So dialogue allows me to focus on less time-based aspects of life, which are primary to this book. It’s tell-don’t-show. I wanted to build an alternate American culture, and to explore the philosophy supporting it, which is actually one of the oldest uses of written dialogue—Plato, for example. I chose the interview, over other forms of dialogue, because it is our culture’s way of understanding personality, which is another focus of the book. Police interrogations, psychotherapy sessions, court room depositions. It’s also the way we understand our favorite personalities: celebrities. Talk shows, podcasts, magazines. We get pleasure from just hearing these people talk, and that’s the kind of pleasure I wanted to give the reader. For Book of Formation, you’ve created an entire lifestyle philosophy known as “Personality Movement” where people seek to achieve some sort of enlightened state through ideal personalities. What were some of your real-life inspirations for PM? How did you come develop its characteristics—the language, the beliefs, the gurus, the followers? And did you ever think about PM outside of writing this book? I’ve spent years thinking about personality transformation, long before I began writing the book. I’ve changed my personality in many purposeful ways and I’ve done so using a series of exercises and philosophies that I’ve invented. Some of practices resemble those in this book, some don’t. I did this because, as a teenager, I realized that I was controlled by my personality. I’d constructed a self that I displayed to the world, and I spent my days sculpting it, fine-tuning it. And I became dissatisfied with the self I’d constructed over the years. It was boring, consisting largely of my opinions, tastes, tendencies. What was my favorite food? Am I an introvert? Am I stubborn? What music do I listen to? What are my politics? I began to see the personality as a cage, and when I looked to older people, I saw that they were in even stronger, smaller cages, from which they might never escape. I didn’t want to be fixed, so I began to loosen myself. I stopped making decisions based on who I thought was, and started making other kinds of choices, against myself, toward other selves.And for awhile, it worked. After doing this for a decade or so, though, I came to understand, that I was still making a system of thought, a way of acting and thinking that was prescribed, rule-based, as all systems are. Which was a problem—I didn’t want to subscribe to a system of thought. I have tried and failed many of them: religions, schools, ideologies, scientific models, exercise protocols, alternative diets. They all fail on me. There’s something addictive about them. As soon as I start learning about one that interests me, I’d cling to it and I start excluding and judging everything that isn’t a part of it. In fact, this is what these systems are designed to do: prove themselves right. Nature, on the other hand, doesn’t have systems. It’s just pure chaos. As I’ve gotten older, I’m better able to use systems in moments where they are useful, and then put them aside when they become exclusive. They’re just tools. But I still find the addiction to be pretty strong, and whenever I discover a new system of thought, I immediately feel a conflict inside me. Creating “personality movement” was a way to confront these systems. I could research them, understand the elements required to make one and see how they have changed me. I thought that if I built one in earnest, I would have to deal with it from all angles—negative and positive—as something powerful, beautiful, expansive, and dangerous enough to lead me to engage with the great conflicts in the world. I could look at one from a distance, and experience it intimately, from the inside out, as a uniquely human creation that would be capable of defining us, disturbing us, and fascinating us endlessly. Masha is a being raised by PM’s founder and media celebrity Mayah, to be an exemplar of the movement, which requires on his part a lot of forgetting—memories, family, etc… When his humanity begins to show mid-way through the book, being distracted or sick, he struggles with it. When you were evolving Masha’s character, did anything surprise you about how he was growing up? Or did you struggle with how he would mature? When I was writing this book, I pinned a picture by Giuseppe Penone called To Reverse One’s Eyes above my desk. 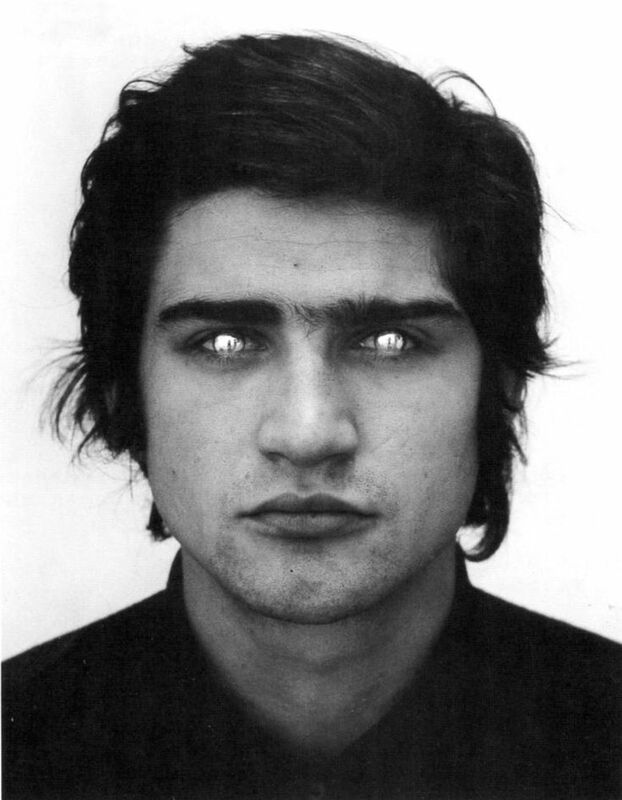 In the photo, Penone is wearing contact lenses made of mirrors. So he can’t see. His vision is just a reflection of the world around him. He’s sacrificed one of the most personal organs — the windows to the soul — for the sake of being a kind of conduit for everything else. I wanted Masha to be an expression of that feeling. He is raised outside of our culture, in a controlled setting, which is a common storytelling trope: the wild child, the stolen baby, Kaspar Hauser, Frankenstein, Edward Scissorhands. So his maturation was as much about cultural assimilation as it was about human development. He was a fresh mirror to reflect society. The book occurs over 20 years, from 1994 to 2014, and I used certain American cultural events of those years to dictate Masha’s experiences: Bill Clinton’s impeachment, the Polly Klass abduction, the rise of Oprah, David Koresh, Columbine… His life experience was culture, which, I think, is what being a celebrity is. Though none of these events are explicitly mentioned in the book, each one informs his personality, the kinds of conversations he’s having, and the situations he experiences. And his experiences paralleled my own, since these are the years when I was coming of age. All of these news events were ones I experienced as they happened, they were my reality, even as I completely misunderstood them. You are the longtime interviews editor at the Believer, a co-host of the radio program the Organist, and you have taught a seminar on oral literature at Columbia. How much of those duties informed the style of this book? Or has your interest in the art and craft of interviews preceded these appointments? Later, I discovered books of dialogue literature which has been important to me for as long as I’ve been a reader. John Cage’s interview books, for instance, were essential to me as a teenager. These interviews taught me how to speak and think. I learned to write by listening to what people around me said, and by transcribing these discussions. I began to interview professionally as soon as I graduated from college. Interviewing was, I learned, was a quick way to be in dialogue with someone who interested me. Sometimes I’d do it for money, but sometimes I’d do it with no recorder or intention of transcribing anything down. I just liked engaging people with a sense of purpose. Ultimately, this became a mode of being in the world. Asking questions is just the natural expression of curiosity. What are you currently working on and what bigger visions of yours would you like to one day see pass into reality? —Finishing some new music, which will come out in February. It’s part of a series of releases for which I written a kind of song cycle. —Working on a series of eight transformed/destroyed galleys of the book, covered in herbs and foods and other materials that relate to the book. These will be shown in vitrines at Printed Matter on November 18th, when I have a talk with Anicka Yi about the relationship between visual art and writing. —Writing a script for a podcast, which is a parallel work to The Book of Formation, dealing with some of the more audio-based aspects of personality movement, but with an entirely different set of characters and ideas. —And playing with the beginnings of a new novel. —As for bigger visions, I’d like to make a film and build a house. The Book of Formation is out now with Melville House.